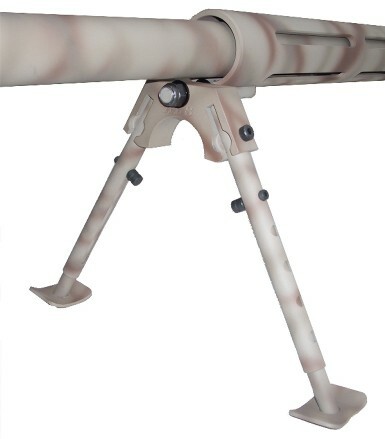 Get your 50 BMG out of the dirt with an all steel folding bipod. Features new larger external adjustment pins that extend legs from 8 inches to 13 inches, and legs lock horizontally into the mounting base. Attaches to weapon with an extended swivel mount that bolts to the barrel shroud. All steel made in U.S.A. Built to last shot after shot.